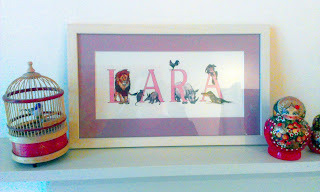 Here's a photo of what the animalphabet names look like framed. The lighting in my flat is awful and my camera phone is grainy, so it's not the best photo! I'm hoping to get some better ones soon.